As most of you will know we in the notog4s campaign have tended to assume that the UKBA /G4S undertakings and official statements have meant that evictions and movements of single people and families would, for the majority, mean movements, at worst, within the broad region of Yorkshire and theHumber. One family of two adults and a one year old were moved on Tuesday 24th July 100 miles from Sheffield toStockton onTees. The UKBA Transition Bulletin openly threatens more families with such a move. 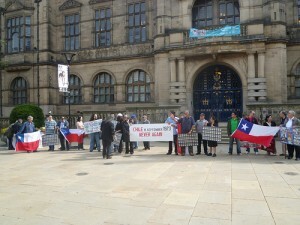 In Barnsley asylum seeker families have been warned by the outgoing asylum team of moves possibly toHullandNewcastle. One family interviewed this week ,of grandparents, parents and school age children, were given this warning and told they would probably have to move their household possessions in two bags each. Live Management, the G4S contractor inBarnsleyis, we understand, considering acquiring unsuitable properties which they propose to use on a ‘temporary’ basis until they can find contract compliant ones. The dreaded Angel Lodge inWakefield, purchased from Angel Housing, has emerged as the newYorkshireIAcentre from September. SYMAAG executive members have horrific memories of actually staying in this dreadful accommodation, oppositeWakefieldhigh security prison. We are campaigning against this decision. Their incompetence in a field they know nothing about – housing – is much more serious – here they are embarking on a contract which they know will threaten the rights and well being of up to a thousand vulnerable asylum seekers in Yorkshire, whom we should be welcoming to our region, not punishing and threatening them, using tax payers money – our money. 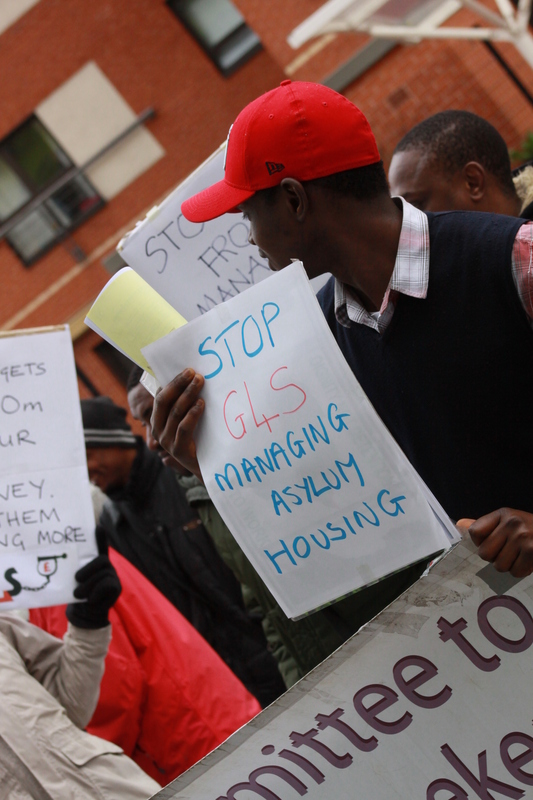 When G4S eventually won the COMPASS contract to house asylum seekers in Yorkshire, Humberside and the Midlands they were well aware that their experience with asylum seekers was limited to detaining them, transporting them to detention centres and (until the death of Jimmy Mubenga, while in G4S custody, in 2010) forcibly deporting them. G4S tried desperately to point to their use of “caring” sub-contractors. They pointed to their sub-contract with United Property Management (UPM). For anyone familiar with asylum housing and especially for anyone unlucky enough to have been housed by UPM, this was a bad joke. Apart from a history of gross inefficiency, many people seeking asylum associate UPM with abusive behaviour: “They (UPM) come round at any time. They open the door of the house without the knowledge of the people who live there” one Rotherham asylum seeker told SYMAAG. In another property, housing 6 people, UPM had provided one old cooker, one set of cutlery, one plate and one pan: “We had to cook in shifts, sometimes I didn’t eat until after midnight” one ex-UPM tenant reported to us. So ex-tenants of UPM, asylum rights campaigners and most people who ever came across them were delighted when UPM were dumped as G4S sub-contractors last month after a campaign by Why Refugee Women? and SYMAAG. G4S thrashed around for replacement sub-contractors, settling on 2 minor property managing companies (with zero experience of housing asylum seekers) and a third, Cascade Housing which is so poor it was once sacked by UPM for incompetence! The 4th replacement sub-contractor was to be Target Housing, a Sheffield-based charity which had a record of working with ex-offenders and other vulnerable groups. It would be fair to say that Target Housing, run by Gino Toro a Chilean refugee, enjoyed a reputation as an organisation with some integrity. Until that is, they took G4S’ money and became their major subcontractor in Sheffield, Rotherham (and potentially Derby and Hull). The Chilean community in South Yorkshire, asylum seekers and campaigners have been appalled that Target Housing is prepared to give cover to G4S, allowing them to claim that a (hitherto) respected housing charity is on board. Target make big claims about the services they intend to provide to asylum tenants, but with a handful of (underpaid) staff and (untrained) volunteers, the sums just don’t add up. We have appealed to Target CEO Gino Toro to withdraw from the G4S COMPASS contract. Even with G4S’ Olympic shambles on everyone’s lips, he refused. So SYMAAG, along with asylum seekers housed under the new COMPASS contract will be keeping a close watch on Target – and all the other sub-contractors. When they fail to treat asylum tenants with dignity or provide the service they deserve, we will protest. 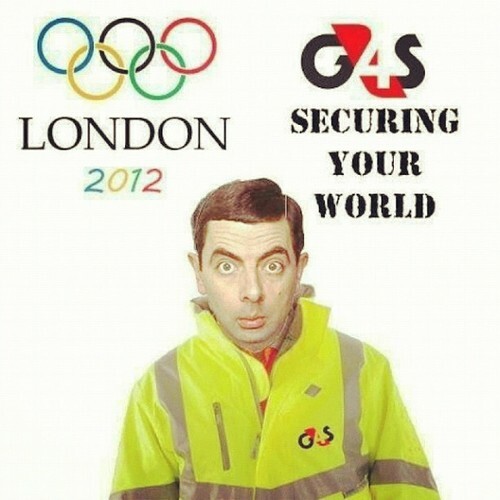 Sheffield charity Housing association gets £2.5 m asylum housing contract from ‘shambles’ Olympics security company G4S. Target Housing Association a Sheffield based charitable housing association has shocked the charity and asylum rights world in Sheffield by becoming a subcontractor for asylum housing for Olympics security firm G4S the world’s largest security corporation. G4S has already taxpayer funded contracts worth hundreds of millions pounds in managing privatised prisons, police and court services as well as its core business of providing security personnel – a business now in tatters after its Olympics fiasco. Campaigners claim Target, desperate for contracts to survive, is collaborating with G4S in a cut price deal which means Target senior staff on the asylum contract will be paid the same £8 an hour that G4S guards at the Olympics are getting. Services to asylum seeker families will be cut back to cut costs. Asylum rights group SYMAAG say Target is desperately offering itself as a fig leaf to G4S to cover up the fact that G4S has no experience in managing housing, whereas Target up to now has been respected as providing housing and services for ex offenders on local council contracts in South Yorkshire. Latest news: UKBA claim there is “no evidence to substantiate the allegations that returnees to the DRC are at risk” (UKBA Chief Executive Rob Whiteman in a letter to Paul Blomfield MP 31/7/12.) See Returns to DRC letter from Whiteman to Paul Blomfield MP.